REEDVILLE—Thomas Andy Walters Sr., 88, of Reedville went to be with the Lord March 31, 2019. He was preceded in death by his loving wife, Evelyn E. Walters; parents, Thomas G. and Mary Ruth Walters; and brothers-in-law, Lamar Hunt and Willie Goin. 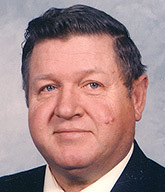 He is survived by his children, Thomas A Walters Jr. (Cathy), Bonnie Lynn Skiba (Jim), Clarence G. Walters and Crystal D. Kelley (Jason); eight grandchildren; 15 great-grandchildren; sisters, Annette Hunt, Myra Ruth Webb (Kenneth), Linda Blankenship (Shelby), Carol Armentrout (George) and Martha Gieger. Tom was a loving father and grandfather. He was a local hero who served the community as both a Richmond City police officer and firefighter. He will be missed by all those who loved him and all of those whom he loved. The family will receive friends from 6-8 p.m. Thursday, April 4, at Bliley’s-Chippenham, 6900 Hull Street Road, Richmond, where a funeral ceremony will be held at 1 p.m. Friday, April 5. Interment will follow at Dale Memorial Park.